This whole LP is fantastic. Great orchestral playing and the soloist if beyond superb. The sound is super with great sonority and lots of bass slam and hall ambience. Go get it now! Sweet violin tone that sounds very close. Oh the sound of the bow on the strings. What a sound! Rated 19 /20 in Robert Moon, Blue Back Guide. "Hindemith's concerto has never before blossomed into such rewarding lyricism. Even the orchestral contribution under the composer himself is strikingly passionate and with the soloist to provide many moments when the ear is ravished by the beauty of phrasing and inflection, the listener has much to enjoy. The recording is one of the very finest ever made of the combination of solo violin and orchestra. The Oistrakh/Horenstein performance completely displaces its competitors. 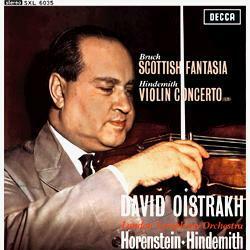 It is marvelously well recorded -- Oistrakh has never sounded so real on a disc before -- and the reading owes nearly as much to the conductor as the soloist. The expansive dignity of the opening of the brass sets shows immediately how fine the orchestral contribution is going to be and Oistrakh's playing throughout is ravishing, raising the statue of the work immeasurably. The slow movement is especially memorable."